Drag the appropriate labels to their respective targets. Which of the following terms describes layer D? Which of the following correctly describes a common feature of all structures labeled A-D in the figure? Structures A, B, C, and D are located in the dermis. Which of the following would most likely be found in the stratum spinosum? 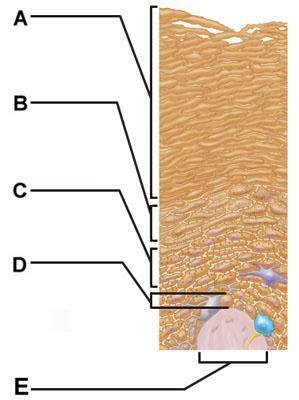 Which skin-color-associated, pigment-producing cell is located in the labeled layer D? The structure indicated by label E is part of which of the following? Transformed cells within labeled layer C give rise to which form of cell cancer? What is the function of structure B? The ________ is a thin translucent band found only in thick skin. 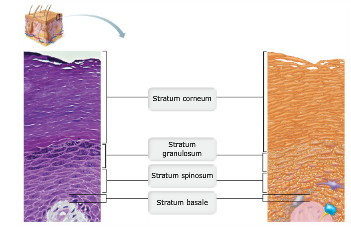 Which stratum of the epidermis is responsible for regenerating the more superficial layers? Melanocytes and keratinocytes work together in protecting the skin from UV damage when keratinocytes ________. Water loss through the epidermis could cause a serious threat to health and well-being. Which of the following protects us against excessive water loss through the skin? Lamellated granules of the cells of the stratum granulosum, a glycolipid that is secreted into extracellular spaces. Despite its apparent durability, the dermis is subject to tearing. How might a person know that the dermis has been stretched and/or torn? The appearance of visible, silvery-white scars is an indication of stretching of the dermis. The design of a person's epidermal ridges is determined by the manner in which the papillae rest upon the dermal ridges to produce the specific pattern known as handprints, footprints, and fingerprints. Which of the following statements is true regarding these prints or ridges? They are genetically determined, therefore unique to each person. Which of the following statements indicates the way in which the body's natural defenses protect the skin from the effects of UV damage? Prolonged exposure to the sun induces melanin dispersion, which in turn acts as a natural sunscreen. Skin surface markings that reflect points of tight dermal attachment to underlying tissues are called epidermal ridges. The dermis is rich in blood vessels and nerve fibers. Which of the following represents a difference between eccrine sweat glands and apocrine sweat glands? The secretions of apocrine sweat glands contain more fat and protein than do the secretions of eccrine sweat glands. Tactile cells anchor the skin to the body. Which structure is a type of sudoriferous gland? Cell division would be most common amongst cells in which of the labeled layers? A needle would pierce the epidermal layers of the forearm in which order? Most of the cells in layers A through D are of which type? Regardless of race, all human beings have about the same number of melanocytes. Which structure is a type of cutaneous sensory receptor? Which of the following is a skin sensory receptor for touch? Which labeled structure produces an oily secretion? Which skin pigment is made in the skin itself? The most dangerous type of skin cancer is ________. The pinkish hue of individuals with fair skin is the result of the crimson color of oxygenated hemoglobin (contained in red blood cells) circulating in the dermal capillaries and reflecting through the epidermis. A cancerous growth on the skin will likely exhibit ________. Which of the following cutaneous receptors is specialized for the reception of touch or light pressure? A dendritic or Langerhan cell is a specialized ________. 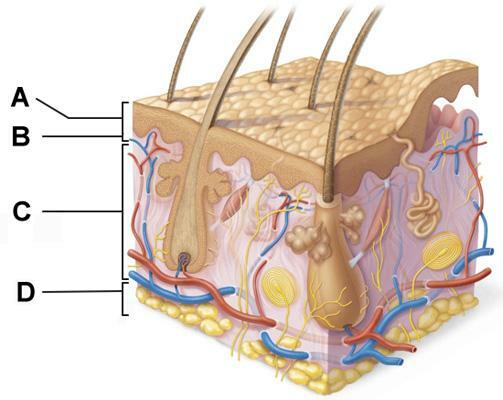 The dense fibrous connective tissue portion of the skin is located in the reticular region of the dermis. 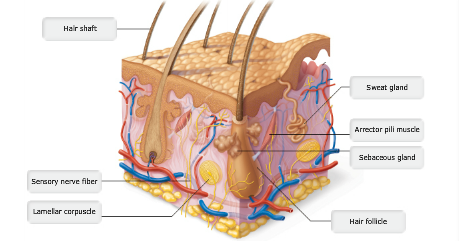 The epidermis consists of five layers of cells, each layer with a distinct role to play in the health, well-being, and functioning of the skin. Which of the following layers is responsible for cell division and replacement? Which is the most common type of skin cancer? 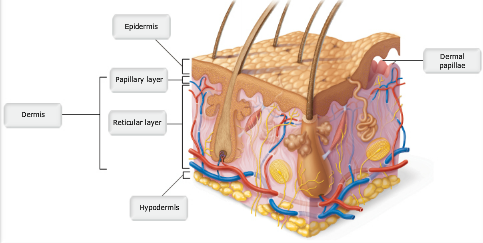 Which of the following is NOT a layer of the epidermis? The protein found in large amounts in the outermost layer of epidermal cells is collagen. The skin consists of two main regions. From deep to superficial they are the ________. 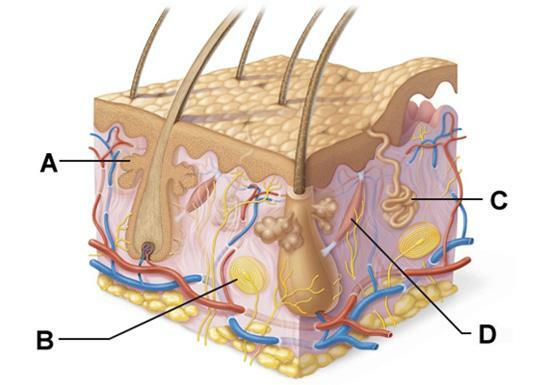 Which layer of the dermis is directly below the epidermis? Layer B is composed primarily of ______. The integumentary system is protected by the action of cells that arise from bone marrow and migrate to the epidermis. Which of the following cells serve this function? Sudoriferous (sweat) glands are categorized as two distinct types. Which of the following are the two types of sweat glands? Which layer(s) of the skin is(are) damaged in a second-degree burn? The epidermis and the superficial region of the dermis are damaged. Layers B and C collectively form the ______. The biggest risk factor for the development of skin cancer is excessive exposure to ultraviolet radiation from sunlight. Sweat is secreted by ________. Which layer is composed primarily of stratified squamous epithelium? Apocrine glands, which begin to function at puberty under hormonal influence, seem to play little role in thermoregulation. Where would we find these glands in the human body?